The Embraer Phenom 300 cockpit is a fully featured cockpit, allowing the Phenom 300 light jet to be flown by one pilot. Embraer teamed up with Garmin to develop the Phenom 300's avionics. The avionics system in the Embraer Phenom 300 Cockpit is called the Prodigy Flight Deck 300 and is developed exclusively for the Embraer Phenom 300's flight deck. The Prodigy Flight Deck 300 is basically a Garmin G1000 Avionics suite with a maintenance computer and other features. The Embraer Phenom 300 cockpit is similar to the Embraer Phenom 100's cockpit and both aircraft have a very similar layout in the cockpit. In the Embraer Phenom 300 cockpit you will find 3 glass cockpit displays that measure 12.4 inches. 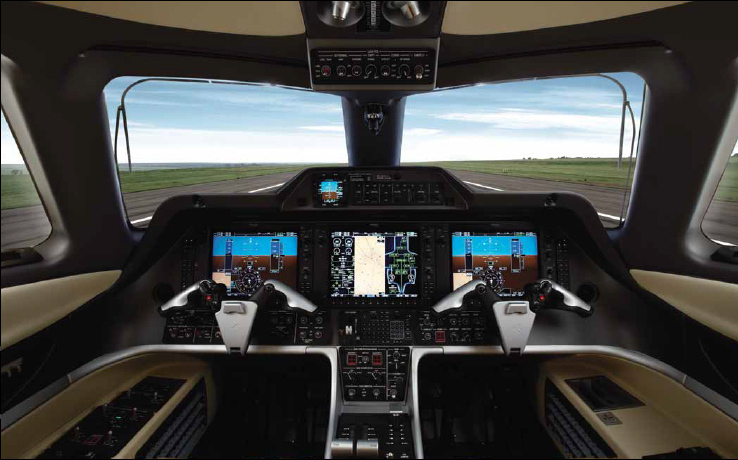 The 3 displays in the Phenom 300 flight deck can display interchangeable information. Another key feature of the Embraer Phenom 300 cockpit is that there is no overhead panel and there are only a few switched located at the top of the flight deck. Update: In May 2013 Embraer got approval from the FAA to change the avionics system on the Embraer Phenom 300 to the Garmin G3000 avionics suite, which has touchscreens. More information will be updated later on this new avionics system that is available for the jet. Above Embraer Phenom 300 Cockpit - Flight Deck Photo from the Embraer Phenom 300 Brochure. Copyright Embraer. Three widescreen 12.4" interchangeable displays inside the Embraer Phenom 300 Flight Deck. Soft keys on displays minimize navigation time on menus. No overhead panel and reduced number of switches. Reduced pilot checklists thanks to smart systems automatism. Electronic checklist and system synoptic. Weather radar with vertical scan capability. Coupled VNAV (Vertical Navigation) and RNP 1 (Required Navigation Performance). Central Maintenance Computer (CMC): quick fault location and isolation. For reference: The Embraer Phenom 300 Cockpit is also known as an E55P Cockpit, Embraer 300 Cockpit, Phenom 300 Cockpit, EMB-505 Cockpit, Embraer 300 Phenom Cockpit, Phenom Jet Cockpit, Phenom 300 Jet Cockpit, Embraer Phenom 300 light jet Cockpit, Embraer Phenom 300 airplane Cockpit, Embraer Phenom 300 aircraft Cockpit and the Embraer Phenom 300 Business Jet Cockpit. Also The Embraer Phenom 300 Flight Deck is also known as an E55P Flight Deck, Embraer 300 Flight Deck, Phenom 300 Flight Deck, EMB-505 Flight Deck, Embraer 300 Phenom Flight Deck, Phenom Jet Flight Deck, Phenom 300 Jet Flight Deck, Embraer Phenom 300 light jet Flight Deck, Embraer Phenom 300 airplane Flight Deck, Embraer Phenom 300 aircraft Flight Deck and the Embraer Phenom 300 Business Jet Flight Deck.